Canoa Ranch in Green Valley, Arizona is a 55+ community that surrounds the beautiful Canoa Ranch Golf Club. Homeowners enjoy access to world-class amenities through Green Valley Recreation’s 13 facilities. Canoa Ranch offers a variety of home styles that feature one-level living with low-maintenance exteriors. Canoa Ranch offers both new construction and resale homes throughout the community’s 480 acres. Green Valley Recreation (GVR) offers retirees 13 recreation centers that include amenities such as fitness centers, ballrooms, hobby and craft areas, aerobics and dance studios, woodworking shops, and multi-purpose meeting rooms. Outside, the grounds of Green Valley are equipped with 13 swimming pools, fishing lakes, miles of walking and biking trails and tennis, pickleball, bocce ball, shuffleboard and basketball courts. 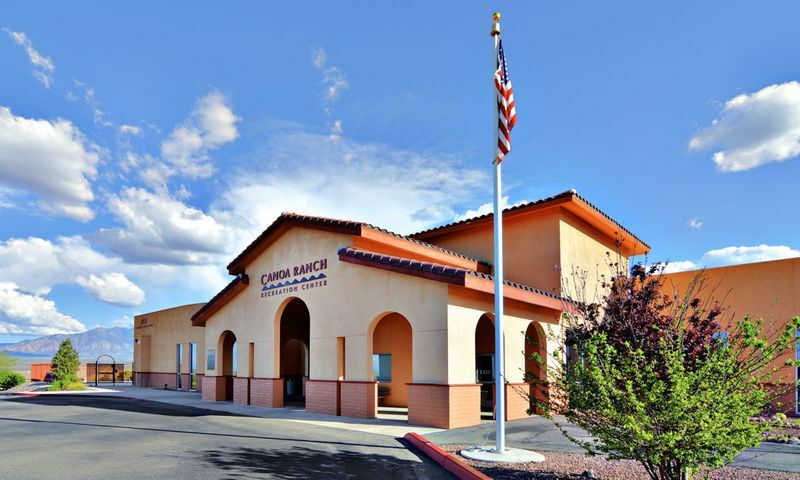 Residents of Canoa Ranch have access to all of these amenities. Homeowners of Canoa Ranch enjoy living near the thirteenth (and newest) recreation center in Green Valley. Canoa Ranch Recreation Center includes an indoor and outdoor pool, fitness center, hobby room, library, billiards and more. Canoa Ranch residents are not limited to the amenities within their community. Golf enthusiasts are surrounded by great courses including the 7,013-yard Canoa Ranch Golf Club that winds throughout the community. Acclaimed golf course architects Lee Schmidt and Brian Curley designed it this course that boasts dramatic elevation changes, strategic bunkering and spectacular views of Elephant Head. There are five sets of tee boxes to accommodate golfers of all skill levels. Construction of Canoa Ranch began in 2000 and upon the community’s completion it is expected to have 2,500 homes. Canoa Ranch offers condos, attached homes, and single-family homes in a variety of sizes. Fairfield Homes designed three condo floor plans that range from 1,503 to 1,729 square feet. These resort-style condos are situated in mid-rise buildings with covered parking. These homes offer two bedrooms and two-and-a-half bathrooms. The villa homes by Fairfield Homes are attached residences that come in two floor plans. The first villa floor plan offers 1,652 square feet of living space with two bedrooms, two-and-a-half bathrooms, and an attached two-car garage. The second villa floor plans offers 2,042 square feet of living space with two bedrooms, a den, two bathrooms, and an attached two-car garage. Meritage Homes designed five floor plans that range offer between 1,510 to 2,012 square feet of living space. These detached ranch homes feature two to three bedrooms, two to three bathrooms, and a two or two-and-a-half-car garage. For homebuyers seeking a larger single-family home option, the estate homes by Fairfield Homes provide between 1,725 to 2,568 square feet of living space. These homes feature two bedrooms, a den, two or two-and-a-half bathrooms, and a two or three-car garages. Residents of Canoa Ranch enjoy a variety of clubs, games, sports, and special interest activities that are hosted in GVR’s facilities. Popular card and game groups include bridge, canasta, hearts, Mah Jongg, poker, and euchre. Active adults who enjoy arts and crafts can join woodworking groups, a ceramics club, quilting club, or lapidary club. With clubs that focus on hiking, swimming, tennis, bocce ball, billiards, and more, it’s easy to stay active while living in Canoa Ranch. With more than 60 activities to participate in, residents are sure to something that sparks their interest. Canoa Ranch is situated in southern part of Green Valley, Arizona. The Green Valley area has over 300 retail stores and is only 30 minutes from Tucson. Outdoor enthusiasts will relish the abundance of recreational opportunities in the area. The surrounding mountains are filled with hiking and nature trails leading into picturesque canyons and ridges. Green Valley has been named among the top ten retirement destinations in the country. Canoa Ranch’s convenient location to I-19, resort-style amenities, and low-maintenance homes makes it a popular community for active adults in Southern Arizona. There are plenty of activities available in Canoa Ranch. Here is a sample of some of the clubs, activities and classes offered here. For homebuyers seeking a larger single-family home option, the estate homes by Fairfield Homes provide between 1,725 to 2,568 square feet of living space. These homes feature two bedrooms, a den, two or two-and-a-half bathrooms, and a two or three-car garage. We moved to Canoa Ranch for a few main reasons. The location, amenities and maintenance-free living. At first I was a little shocked at the monthly fees but it includes so much that when I really looked at it I realized I was getting a lot for my money. It even includes utilities plus all the amenities too. Actually, I should clarify my home includes the utilities, maybe that's not the case for all the homes here. For the amenities, I can use everything here in Canoa Ranch and all the communities affiliated with Green Valley Recreation. It's nice to have so many options. I haven't even had time to see or use all the facilities yet! Overall, this community is a great value down here in Southern AZ and not too far from Tucson either. 55places.com is not affiliated with the developer(s) or homeowners association of Canoa Ranch. The information you submit is distributed to a 55places.com Partner Agent, who is a licensed real estate agent. The information regarding Canoa Ranch has not been verified or approved by the developer or homeowners association. Please verify all information prior to purchasing. 55places.com is not responsible for any errors regarding the information displayed on this website.